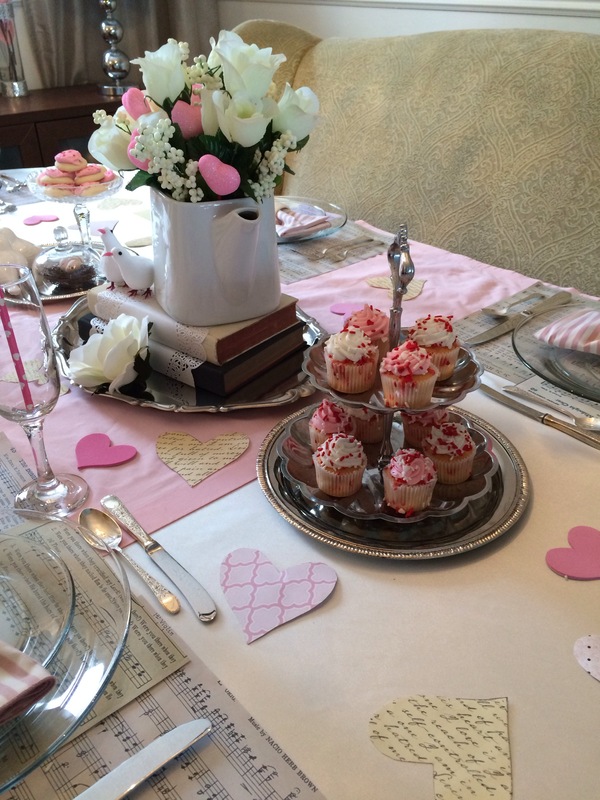 With Valentine’s Day quickly approaching, I figured I would do a tablescape for the big day. This table was put together fairly inexpensively, using mostly items I had on hand. Although, a few new items were purchased. The cute striped napkins were found at a thrift store for $1.99 for 4, along with the white napkin ring holders (also $1.99, but for 12). I also purchased the two little love birds next to the flowers ($1.25 for both), and the cute paper straws with hearts on them ($1.00 for 18). The most expensive item was the new tablecloth. It’s a lovely cream colour with a bit of a sheen to it. The fabric is from Fabricland, and it cost a total of $12.50. It was on sale for $5.00/meter. Since I plan on using this tablecloth over and over again, it was a steal. I love the idea of using music sheets as placemats. What better time than Valentine’s Day to use old music sheets of love songs? Too cute, right? 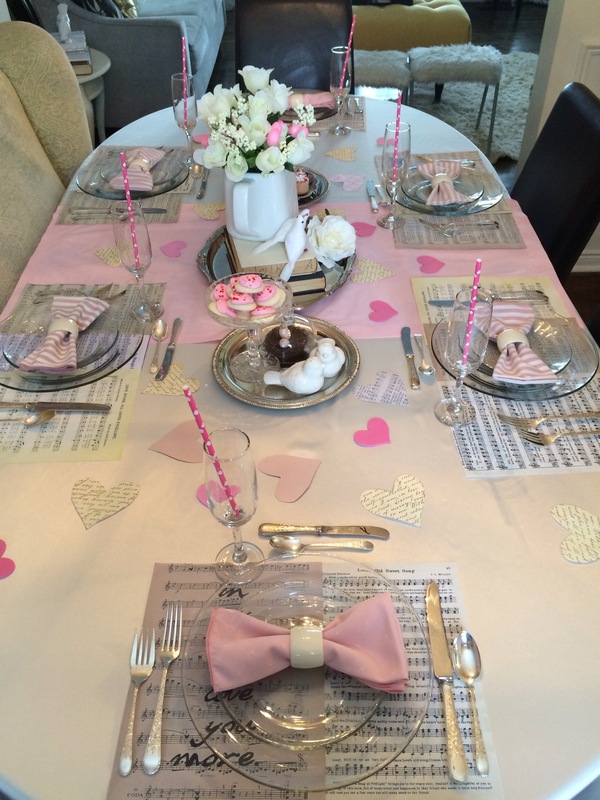 The hearts all around the table were just craft and scrapbook paper. I traced a heart shape and cut them out. The pink ones are just foam hearts from the dollar store I had on hand. Love this little touch, since it can be easily customized to any colour scheme. Since Valentine’s Day is often all about the candy and sweets, I figured I’d go with the flow and put out some store bought yummies. Using food as decor is a favourite trick of mine. And who doesn’t love a good cupcake? 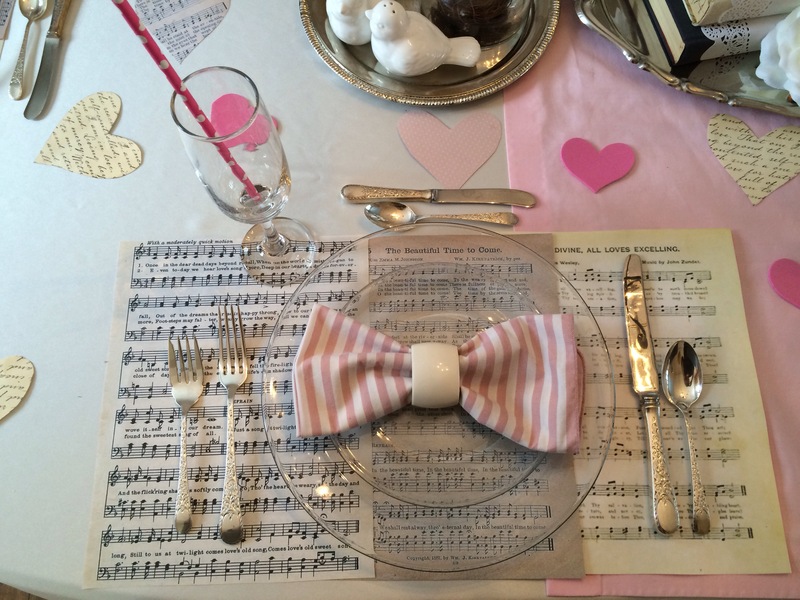 For this table, I opted to use my clear glass plates, so that the cute music sheet placemats could show through. The music sheets are by far my favourite part of this table. 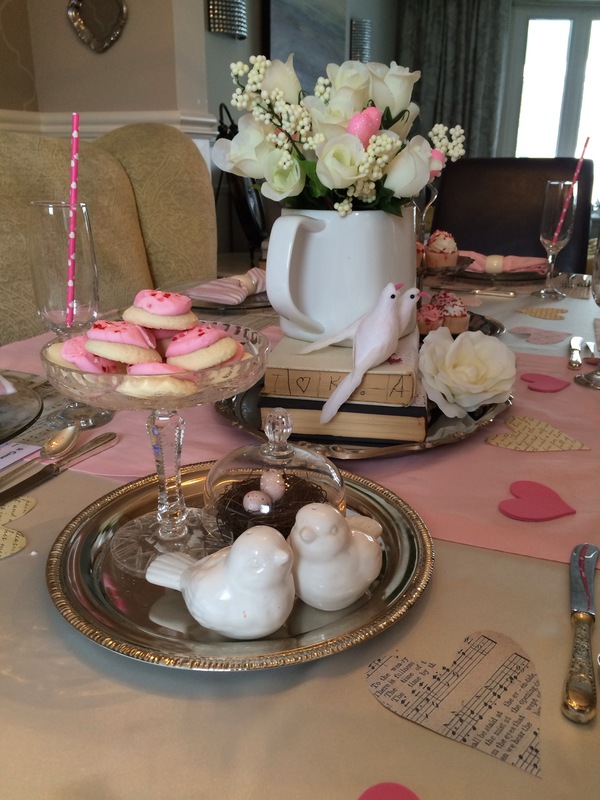 This tablescape ended up being unintenionally all about the love birds. Usually, I have my pink eggs out for Easter, but hey, they looked super cute next to my white salt & pepper shakers, so why not. 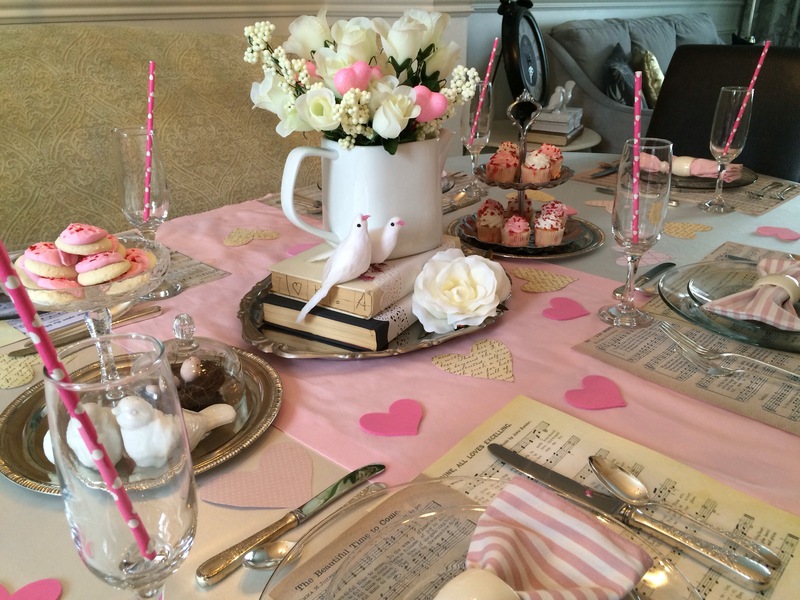 The napkins were made to look like bows <3, and they compliment the whole scheme. I sometimes like to do the heads of the table in a different napkin, just to break things up a bit. 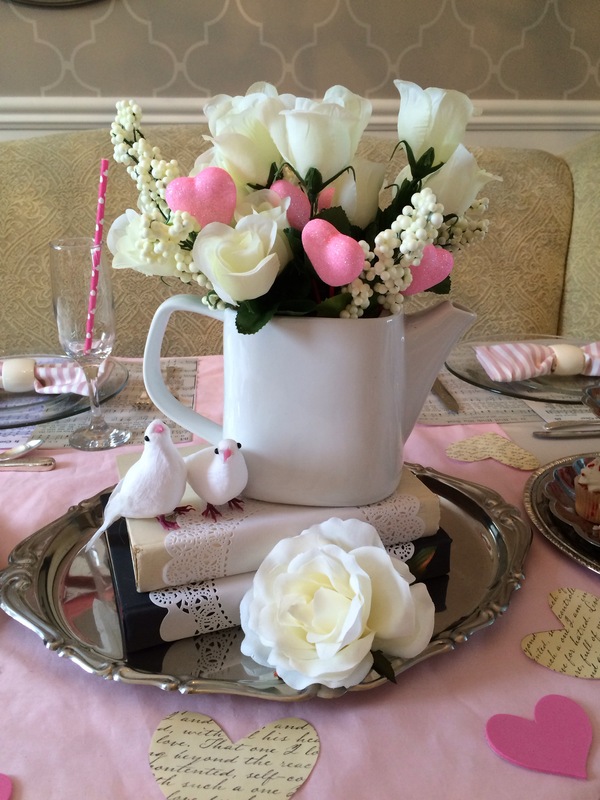 This cute teapot was also a new purchase (not for this table, but just because I needed a new teapot). I found it at Goodwill for $4.00. I wanted a white one, so that it would work with any scheme. Well, that’s it for the mid-week post. 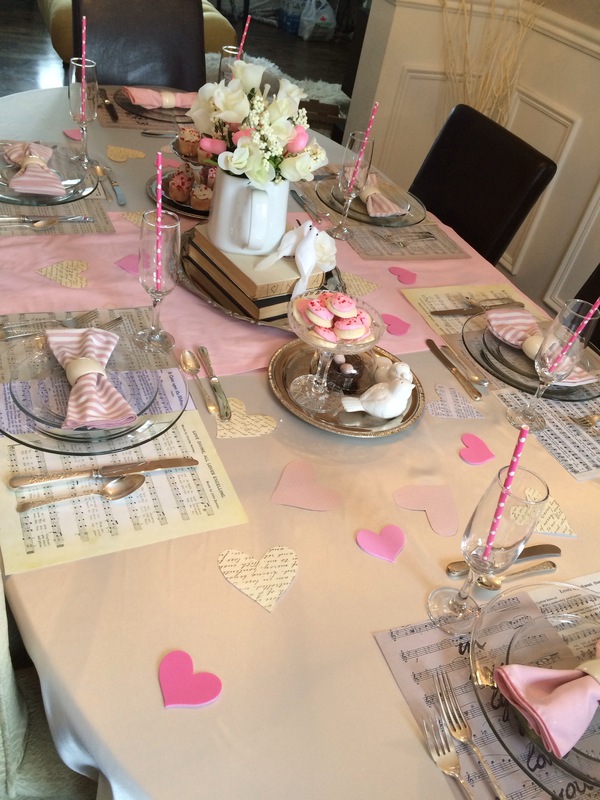 Happy Valentine’s tablescaping everyone! I’ll be back on Saturday with a special post geared to all of you who are planning on staying in to have a quiet Valentine’s evening at home with your sweetheart. 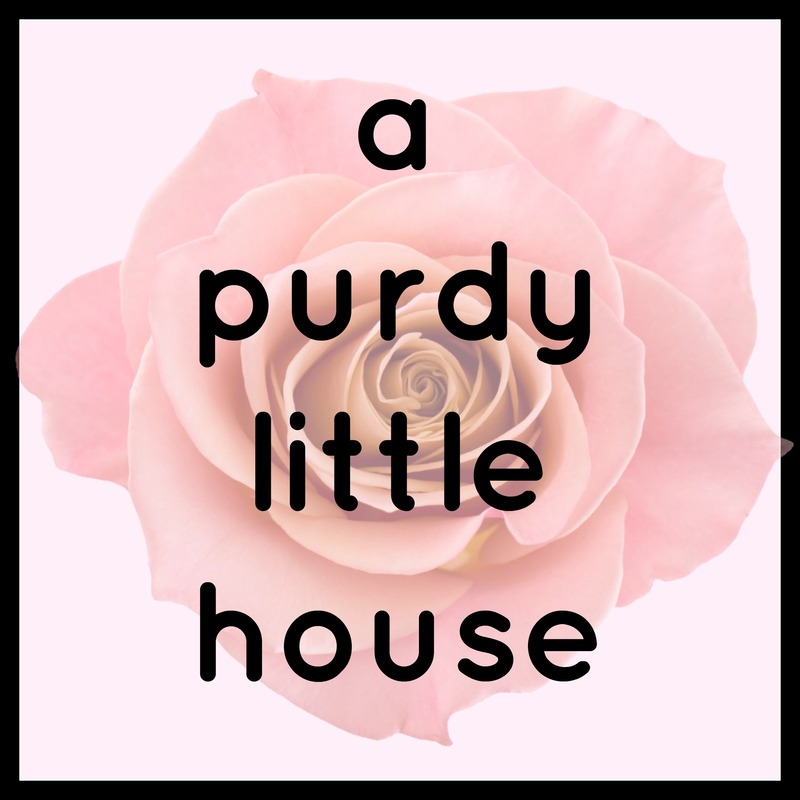 If you enjoyed this post, please re-post on Facebook, Twitter, Pinterest, etc., and don’t forget to subscribe to my blog to get an email notification whenever a new post is published.